Get the adrenaline flowing with an exciting game of fast-action paintball fury! Consisdered one of the safest and fastest growning sports in the US, paintball can be used as an outreach to both teens and adults. The CR field is a nice mixture of both speed ball and woods ball play. 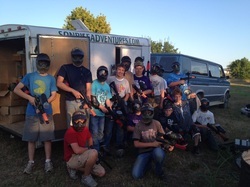 Paintball helps promote leadership, teamwork, fair play, strategy, and Christian sportsmanship. Lessons learned on the field will apply to everyday life and encourage spiritual growth. We have enough equipment to supply most groups. There is a 12yr old age minimum to play paintball at Covenant Ranch.